Nathanael Herreshoff but George Lennox Watson deserved better. After the last modification of Deed of Gift adopted in May 1888, nothing of importance transpired in cup matters until the following spring, when a challenge, dated March 19th, 1889, was received from the Earl of Dunraven. American yacht designing never had a greater revival than that which followed the acceptance of the second Dunraven challenge. Great progress had been made since the days of Volunteer, which was already far outclassed in theory, if not in actual boats. The four candidates for the honor of defending the cup met for the first time on the New York Yacht Club cruise. Little definite was learned here of their relative speed, owing to a succession of light, baffling winds, with fog, while on the first day of the cruise. During my research of plans, specifications or racing events... on the America's Cup, I discovered a booklet of presentation of the race which contains much interesting information. By the time Lord Dunraven's yacht arrived on this side there was plenty of faith displayed in Vigilant. She was as firmly fixed in the hearts of Americans as Volunteer, Mayflower or Puritan had ever been, though it cannot be said that the man who designed her was as popular as Burgess, nor her manager, Mr. C. Oliver Iselin, as was Gen. Paine. Designer Watson Says the Vigilant Is Better than the Valkyrie. The English Cutter Made a Gallant Fight, but Had Hard Luck on the Run Home. The following results are extracted from booklet of presentation of the race "Souvenir. 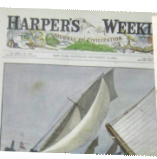 Contest for 1893 America's Cup" published by Thomas Manning and sold 25 cents.